Help Us Showcase Your Business! The Swift Current & District Chamber of Commerce takes pride in referring members like you to business owners and consumers seeking local products and services. Call us at (306) 773-7268 or email us at info@swiftcurrentchamber.ca to give us the opportunity to showcase your talents. Employees. Service. Family. 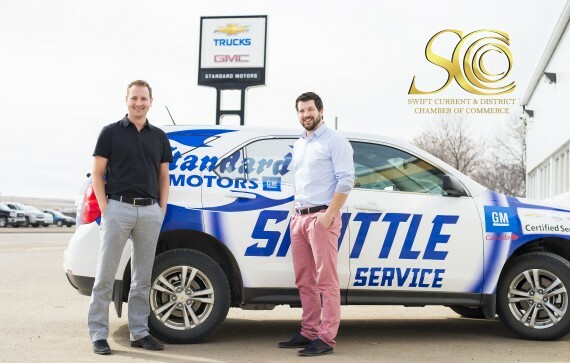 These three words encompass the values and motivation that drives the owners of Standard Motors, Jim, Ryan and Mark Plewis. Standard Motors has been a member of the Chamber of Commerce since 1938. They are well-known in the community for their philanthropy, as a strong employer and an organization who continually supports and participates in community events and organizations. Standard Motors is a family owned business that was established in 1910. Since opening, the business has been passed down through the family and multiple generations. The current owners, Jim Plewis and his two sons, Ryan and Mark Plewis, are looking into the future and they have a clear vision and strong values guiding them. Although the auto industry has changed dramatically over the years, the people haven’t. The Plewis brothers sat down to chat about what the business means to them and their relationships with the organization’s fifty employees. Ryan Plewis, owner of Standard Motors and a City Councillor for the City of Swift Current said, “There are a lot of things that go unseen. Culture is something that you can’t see, but you can definitely feel it. We expect staff will provide exceptional service if they can and that they get rewarded for that. Employees are the face of the organization and make this place successful. One of the keys to how we have been a success for 105 years is because of how we treat our staff. It’s a family mentality. Staff interactions are the ones that count…at least ninety percent of the time. According to the Plewis brothers, one of the best business decisions that Standard Motors ever made was buying out Pratt. This decision changed the organization’s business model, making them significantly more competitive. This competitiveness ensured that people do not need to leave Swift Current in order to get the vehicle they are looking for. Standard Motors has a strong history with the Swift Current Broncos and other sports organizations in the community, so it would be only fitting to compare the attraction and retention of employees to a sports analogy. “We build through the draft…not through free agency.” said Ryan Plewis, “We have made an effort to put high-school co-op students through the program and provide all the training they need. Therefore, we don’t need to go pull someone from Calgary. The brothers have had a lot of fun in the past year. They have worked together to support their win-win philosophy on every angle of the business. Through this process, they saw the morphing of attitudes and payoffs that ensued. Not only was there a buy-in by staff, now they’re flying – they don’t require active management. The sale is just the start of the relationship with a customer.